Among the many tales of woe that appeared in the media in the wake of the Wisconsin protests was the melancholy tale of two public school teachers from Oshkosh who put in their retirement papers in the wake of the union reforms. But a quick search of online databases takes some of the edge off the gloom. 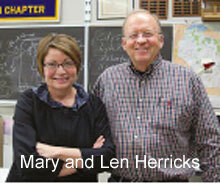 Herricks earned a salary of $68,423. The paper noted that even though she was retiring at 56, she would be able to collect “nearly her former salary” in pension benefits. It got better. Her husband, the local head of the teachers union, was also retiring from a position that paid him $75,916 a year; between the two of them, they made more than $140,000 a year. When generous fringe benefits are added in, the couple earned more than $190,000 in salary and fringe benefits. During his 2008 presidential run, candidate John Edwards frequently cited what he called the “Two Americas,” a reference to what he saw as the gap between the rich and the poor. But the term applies equally to the gap between average America and the new privileged class of public employees like the Herricks, who enjoy expensive fringe benefits and lavish pensions that increasingly define a growing divide among Americans. Even as private sector workers struggle to find and keep jobs, and pay their bills, politicians have lavished expensive perks on public employees under the baleful eyes of ever-more-powerful public employee unions. As he wages his own quixotic war against bloated public pensions, New Jersey Gov. Chris Christie relates the story of one 49-year-old retiree who had paid a total of $124,000 toward his retirement pension and health benefits. “What will we pay him?” asked Christie. “Three point three million dollars in pension payments and health benefits.” A retired teacher who contributed $62,000, says Christie, will get $1.4 million in pension benefits plus $215,000 in health care benefit premiums over her lifetime. “(There are) two classes of people in New Jersey: Public employees who receive rich benefits and those who pay for them,” said Christie. As compelling as the anecdotes of excess are, they do not begin to capture the full picture of the public pension tsunami bearing down on taxpayers. The unfunded liabilities for bloated state pensions are generally a mystery, but Joshua Rauh, a professor of finance at Northwestern University’s Kellogg School, sees deficits of between $3.2 trillion and $5.2 trillion — a massive burden that will inevitably be shifted onto the taxpayers and perhaps lead to a new round of bailouts. During flush times, politicians have rushed to fatten benefits, with the argument that higher stock prices will pay for the increased pensions and that taxpayers have nothing to worry about. By the time the public is faced with massive unfunded liabilities and escalating contributions, it is often too late to stop the hemorrhaging. When, for example, the California legislators voted to jack up state pensions in 1999, they were told in a brochure from the California Public Employees’ Retirement System that the increase wouldn’t cost the state any additional money. They were assured that the pension increases would all be covered by investment earnings. At the same time, the system’s own actuaries tried to warn that if the markets did not follow the rose-colored scenario, the cost to the state could explode, from $159 million in 1999 to more than $3.9 billion in 2010-2011. As blogger Ed Mendel points out, that forecast “scored a near bull’s-eye” on the $3.888 billion state payment for a recent fiscal year. Unfortunately those warnings were ignored, as they were in states and cities across the country. As fringe benefit and pension costs balloon, government budgets are eaten from within, sucking up money that is no longer available to fund police officers on the street or teachers in the classrooms. There are several reasons for this. Government is the most heavily unionized sector in the American economy, and the public employee unions have become adept at making their political influence felt at the polls, with the effect of making many of the decision-makers actually beholden to the unions with whom they are ostensibly negotiating. Adding to the conflict of interest, many officeholders share in the generous benefits they grant to other public employees. During the 2010 midterm election cycle, for example, the largest public employee union, AFSCME, spent more than $87 million to back Democratic candidates; the union’s expenditures amounted to nearly a third of the pro-Democrat independent spending in that year’s campaign. The ballooning expenditures — up from just $19 million in 1997-1998 — reflect both the growing number of government jobs and the higher stakes in preserving unions gains. “We’re the big dog,” boasted the head of AFSCME’s political operations. It would be unfair to blame all of this on public employees, many of whom work hard at difficult and crucial jobs. The same cannot be said of the public employee unions and their incestuous nexus with the politicians who have abetted their rise and bloat. The public union experiment over the last half century has been a disaster: The unions have become an entrenched, obdurate and grasping special interest devoted to expanding government spending and employment, even at the expense of public services. Ironically, the public employee unions bear only a passing resemblance to their private counterparts: government is a monopoly. Unlike private unions, there is no competition that limits their appetites or against which their demands can be measured. Public employees also enjoy civil service protections that are largely unknown in the private sector, and despite the size and clout of the public employee unions, most of them cannot legally strike. But even in times of economic distress, the unions remain a powerful barrier to reform and innovation, protecting the status quo as they protect their own powers, privileges and perks no matter how unsustainable. The result is that public employees have become a new class of takers, increasingly mooching off taxpayers even as services are curtailed, especially at the local and state level. The War in Wisconsin demonstrated just how far they are willing to go to hold onto their claim on other people’s money. In early 2011, traditionally progressive Wisconsin became Ground Zero for the fight over public employee privileges. When Gov. Scott Walker proposed curtailing public employee union power, the Capitol was besieged by hundreds of thousands of protestors and gripped by weeks of legislative gridlock and legal wrangling. Teachers staged illegal sick-outs, legislators received death threats, businesses were threatened with boycotts, and civil rights leaders descended on Madison, trailing clouds of apocalyptic rhetoric unheard since the heady days of the ’60s. The Reverend Jesse Jackson compared the struggle to preserve union power not only to the civil rights movement, but to the Exodus, comparing the mild-mannered and somewhat wonkish Walker to “a modern-day Pharaoh.” This was relatively mild compared to protest signs that compared the governor to deposed Egyptian dictator Hosni Mubarak and Adolf Hitler. Ironically, the protests had been launched by some of the most generously compensated public employees in the country who were being asked to make relatively modest contributions to the state’s massive deficit. Wisconsin had lost more than 170,000 jobs in the Great Recession — almost all in the private sector — and the state’s per capita income had fallen below the national average. Even so, Wisconsin’s overall tax burden continued to be among the heaviest in the nation, in part because government workers had been shielded from the economic tribulations. State employees, for instance, enjoyed one of the best pension systems in the country. Those pensions were funded by contributions from the state and from the employees themselves — except that the state also paid the “employee” portion of the pensions. As a result, while taxpayers contributed $1.37 billion a year into the state’s pension fund in 2009, most state employees paid precisely nothing toward their own retirements. Walker’s proposal would have required them to contribute 5.8% of their salaries toward those pensions, as well as 12.6% of the cost of their increasingly expensive health care premiums. Even with the additional health care costs, government workers would be paying less than half of the national average for health insurance. Before Walker’s proposal, Wisconsin taxpayers were paying $19,128 toward the average employee’s family premium. The average employee contributed a mere $936. Under Walker’s plan, employee contributions would have averaged about $2,500, still far less than the average private-sector employee’s contribution. Taxpayers had been contributing $1 billion a year to employee health insurance, while Wisconsin’s pampered public employees paid a mere $64 million. The dramatic backlash exposed not only the gap between the benefits of the public and private sectors, but also the depth of the sense of entitlement among well-heeled public employees who had drunk deep from the cup of victimism. In some respects, Madison may have represented the first Greece-like moocher rebellion. 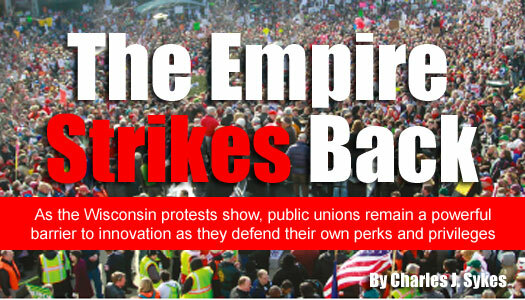 As the battle over the two Americas escalated in Wisconsin, union leaders executed a tactical pivot, insisting that the uproar was not really about money at all, but rather about “rights.” Walker’s proposal included sharply curtailing the ability of government unions to bargain for anything other than wages and eliminated both mandatory union membership and the automatic deduction of union dues from public employee paychecks. Some of the government unions said they would agree to the increased pension and health care contributions, but insisted that they be able to retain all of their collective bargaining rights. Protestors insisted that those “rights” to bargain were fundamental civil rights. This was, of course errant nonsense. There is no “right” to collectively bargaining. Most federal employees are not permitted to collectively bargain for either wages or benefits — and have never been allowed to do so under either Republican or Democratic presidents. In practice, collective bargaining is less about rights and more about power as over time governments have ceded their authority to unions. In the voluminous teachers’ contract in Madison, for example, the list of items subject to collective bargaining includes everything from the size of bulletin boards to lighting, noise, chairs, footrests, adjustable terminals and keyboards, wall coverings and carpets, and room temperature. So great was the clout of teachers unions that they were able to insist that school districts throughout the state contract with their parent union’s own insurance company to purchase health insurance, even though it often cost far more than comparable policies. Riding the collective bargaining gravy train, some Wisconsin teachers were able to get a full year’s worth of salary for just 30 days of actual work. In Green Bay, for example, the teachers’ union contract created an “emeritus program,” under which teachers were paid a full year’s salary — in addition to their already generous pensions — for showing up just 30 days over a three year period. Madison’s teachers had an even sweeter deal, since they had collectively bargained for an “emeritus program” that paid retirees nearly $10,000 a year on top of their pensions. Unlike the Green Bay deal, Madison teachers were not required to show up for a single day of work to receive the benefit. In another school district, teachers enjoyed a staggering 90 paid sick days a year. Because the school year in Wisconsin was 180 days long, this meant that they could be paid a full year’s salary for just 90 days of work. In Milwaukee, the teachers union convinced the district to pay health care premiums for retirees, a benefit that in 2016 will cost $4.9 billion, four times the Milwaukee school system’s entire current annual budget. Ultimately, the ferocity of the union backlash can be explained simply: It was not about rights. It was not even about the bloated salaries and benefits. It was about power and the threat posed to that power by proposals to end forced union membership and the automatic collection of dues. The power of labor rests increasingly on the power of public sector unions, and the mother’s milk of their power and political influence is their access to millions of dollars of mandatory, government-collected union dues. For the unions and their political allies, there is no threat more dire than the prospect of letting government workers voluntarily choose whether they will fund the union’s coffers. In that respect, the story of Indiana Gov. Mitch Daniels is telling. Daniels wasted little time in cutting off the power of the government unions, eliminating their right to collectively bargaining on his second day in office. When Daniels became governor, 16,408 government workers paid dues to the public employee unions. Six years later, just 1,490 did.